DOWNTOWN — Jason Stroming had heard rumors of a ghost inhabiting Downtown's Bridge Cafe, at the foot of the Brooklyn Bridge. Being an amateur paranormal investigator, he went to check it out. Hours later, playing back tape recordings made on the supposedly haunted third floor of the building, what he believed to be a woman's voice cracked the silence. "I'm here," it moaned. In the October 2009 recording Stroming and two colleagues are discussing the temperature drop in the room, a phenomenon the investigator says often accompanies visitations from the spirit world. "You can hear me, Jimmy [Bricks] & Laura [Pennace] talking, [we] are discussing the odd temperature drop in the room, and then you can hear a whisper saying "I'm here!" into the microphone on our recorder. It's right before I say, 'Let's hang out here for a little bit then'," said Stroming, founder and lead investigator of the New York Paranormal Society of the audio recording. Some residents say the park is not haunted at all, just filled with raw nature, which may be startling to some Manhattan residents. The third floor room of the 279 Water St. property was storage space for a bar that operates below, but the building, constructed in 1794, has a dark history as a 1920s brothel. Manhattan's age and population makes it a goldmine for ghost enthusiasts. “Because of its long and rich history, I definitely believe there are hauntings here in New York City," said Stroming. DNAinfo has compiled a list of supposedly haunted locations around the borough, from a mysterious lady spotted at the Merchant House Museum in NoHo to the notoriously haunted Dakota building on the Upper West Side. 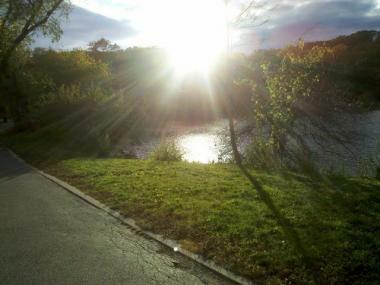 Even outdoor spots, such as Inwood Hill Park, have some Manhattanites spooked. Since the 1930s, visitors to the Merchant House Museum in NoHo have said that doors in the historic house open and close for no apparent reason. Patrons have also caught glimpses of "a little old lady who looks just a little funny," says Eva Ulz, a representative of the 29 E. Fourth St. museum, which was built in 1832 and occupied by a wealthy merchant family, the Tredwells, until 1933. Yet when visitors turn to look at the woman again, she's gone, Ulz says. Staff members at the Merchant House Museum sometimes smell cigar smoke in the house's bedrooms, according to Ulz. Other visitors detected something unfamiliar, which was eventually identified as the scent of smoke from gas lights by an historic lighting conservator. The Tredwell family used gas lighting. Ulz says that the meticulous preservation of the building, which includes more than 3,000 items owned by the family, would appeal to ghosts. "Unlike in so much of the city, this building has been kept intact," she said. "That's really conducive to letting people cross over." The Merchant House Museum gives tours only around Halloween, Ulz said. Among the waves of immigrants who have passed through the East Village over the centuries, none are better known than former Dutch director-general and Manhattan founding father, Peter Stuyvesant. Legend has him haunting St. Mark’s Church-in-the-Bowery on East 10th Street — on a plot of land he owned and was buried in in 1672. It includes reports of Stuyvesant’s ghost hobbling around the church on his wooden leg, the result of being hit by a cannonball. “They used to call him the derogatory name of ‘Peg-Leg Pete,’” explained Andrea Coyle, of the Lower East Side History Project, noting that the sound of his wooden limb could still be heard after his death. She also noted other supposed paranormal happenings at the house of worship, including stories of the church’s bell ringing despite its rope being severed. “The rope was found outside in the graveyard,” Coyle added. The church is also the final resting place for other notable New Yorkers — including 19th century mayors Philip Hone and Gideon Lee, and former state governor and U.S. vice president Daniel D. Tompkins — so who knows what other dignified spirits have had a hand in the hauntings. One of Manhattan's oldest buildings may also be its most haunted. Fraunces Tavern, at 54 Pearl St. in the Financial District, is now a museum, but traces of its past linger in the narrow hallways of the nearly 300-year-old building. The tavern is best known as the place where Gen. George Washington bade farewell to his troops in 1783, but it was also the site of many deaths over the years, said Jennifer Patton, education director of the Fraunces Tavern Museum. In the late 1700s, a woman who was having an affair was stabbed to death by her husband, who then killed himself, Patton said. On Jan. 24, 1975, a bomb allegedly set by Puerto Rican nationalist group FALN exploded in the building, killing four people and injuring many others. And a small fire around the turn of the 20th century claimed the lives of two more innocents: Martha and George Washington, a pair of much-loved cats. So perhaps it's no wonder that night guards at the Fraunces Tavern Museum often report hearing footsteps, slammed doors and jangling keys, Patton said. "There are lots of different stories about occurrences that are unexplained," she said. Last year, ghost investigators at Sleepy Hollow Paranormal spent a night at Fraunces Tavern making observations and taking recordings. They will explain their methodology — and their findings — at a special Halloween event at Fraunces Tavern at 5:30 p.m. Oct. 29, called "'Spirits' of 1776." Tickets are $10 for the public, $5 for members. The 127-year-old Hotel Chelsea has seen its fair share of gore and death, most famously when Sid Vicious' girlfriend, Nancy Spungen, was found stabbed in 1978. But what was once a bustling center of art and bohemian life is now largely empty, and with the exception of a handful of permanent residents, most rooms are being torn apart as part of extensive renovations. 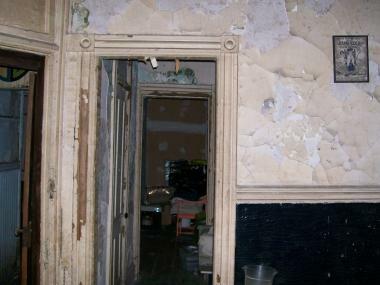 One resident, who would not give her name, said that the now-empty hallways are "swimming" with old ghosts. "The renovations, yeah, it's drumming them up," she said. "Janis [Joplin] and Sid and Nancy — I can feel them and they don't like it." Tucked in a corner of Grand Central Terminal, the opulent Campbell Apartment is one of Midtown’s hidden gems. But in addition to sophisticated cocktails and a well-heeled crowd, the historic lounge has also become a hotspot for ghostly occurrences. Owner Mark Grossich reports a series of eerie phenomena, including unexplained gusts of cold air, flickering light and visions that have led him to believe the space is haunted by the ghost of John W. Campbell, the railroad tycoon who once occupied the space, and transformed it in 1923 into a salon modeled on a Florentine palace, complete with a pipe organ and intricately hand-painted ceilings. “They often see what appears to be an aberration going up the stairs. They’ll look again and then it will be gone,” Grossich said of his staff, who first began noticing the occurrences several years ago. “Some of my waitresses don’t want to be here late at night by themselves,” he said. Wait staff have also reported being in the middle of serving when suddenly they feel someone pushing them from behind. Others have sworn they’ve heard the doors to upstairs bathrooms clicking closed, even when there’s no one around. Most recently, long-time manager Elpidio Hernandez, 36, said he was finishing up paperwork around 1 a.m. on a Friday night when he began to hear a voice calling out from upstairs. “I heard somebody calling my name,” he swears, but soon realized there was no one there but him. “I didn’t know what was going on so I locked everything and left,” he said. Still, Grossich assures there’s nothing to fear. “It’s friendly spooks,” he said. Phil Schoenberg, who wrote "Ghosts of Manhattan," said that Gracie Mansion on East End Avenue and 84th Street and the Mount Vernon Hotel Museum at 421 E. 61st St. are believed to be haunted. People claim that the spirit of Elizabeth Wolcott Gracie, daughter-in-law of shipping merchant Archibald Gracie who died of apoplexy in the house in 1819, still floats around "from time to time." Then there's the ghost of Abigail Adams Smith, the daughter of President John Adams and his wife, Abigail, Schoenberg said. She married Williams Stephen Smith, and they built a grand mansion at East 61st Street on a 23-acre estate along the East River. "They named it Mount Vernon in honor of the estate of her father's good friend, George Washington. Eventually, the mansion burned down, and the carriage house in 1826 was transformed into an elegant hotel, the Mount Vernon Hotel," Shoenberg said. Today, it is a museum owned by the Colonial Dames of America and Smith's ghost is believed to linger there. "Now and then, one of the docents or educational interpreters hears her footsteps," he claimed. Built in 1884, the Dakota, at West 72nd Street and Central Park West, was the city's first luxury apartment building. Since then, it's gained notoriety for qualities other than its ornate architecture. Legend has it that the building is haunted. Construction workers in the 1960s were rumored to have spotted the ghost of a young man or boy, and a smiling little girl dressed in "turn of the century" clothes is said to haunt a 10th floor apartment. The building's spookiness quotient only increased when Roman Polanski filmed the 1968 horror movie "Rosemary's Baby," starring Mia Farrow as a woman carrying the devil's child, there. In the 1980s, John Lennon, who lived in the building, was shot to death on the sidewalk next to the Dakota's courtyard gate as he returned from a recording studio with Yoko Ono. The shooting forever marked the building as a site of tragedy. At the northernmost tip of Manhattan, tales abound of ghosts haunting Inwood Hill Park, whether about the ghost of Anthony Corlear, Peter Stuyvesant’s trumpeter who drowned in the waters off the park while crossing to warn of the British invasion during the Revolutionary War; the haunted boathouses that made up a shantytown in the park during the 1920s; or the spirits conjured up by the Lenape Indians when they ruled the park. Inwood resident Claudette Milken, 36, said she can sometimes hear the the chatter of ghosts in the wind while walking her miniature Chihuahua up in the woods. “Then again, maybe it’s just that there’s so much nature up here, that’s sure to startle most Manhattanites,” she said.